Rickets / Osteomalacia | Infonet Biovision Home. 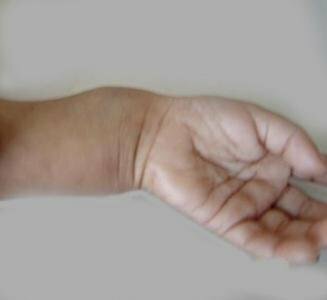 Rickets is the softening of the bones in children, potentially leading to fractures and deformity. 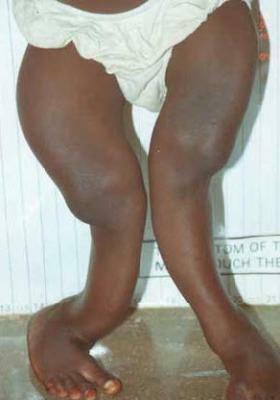 Rickets is among the most frequent childhood diseases in many developing countries. The predominant cause is Vitamin D deficiency, but lack of adequate calcium in the diet may also lead to rickets. Although it can occur in adults, the majority of cases occur in children suffering from severe malnutrition, usually resulting from famine or starvation during the early stages of childhood. Infants who are born prematurely or who have dark skin, and babies who are breast-fed by poorly nourished mothers or who are unexposed to the sun, are all at higher risk for developing rickets. Osteomalacia is the term used to describe a similar condition occurring in adults, generally due to a deficiency of Vitamin D. The origin of the word "rickets" is unknown. The Greek-derived word "rachitis" (meaning "inflammation of the spine") was later adapted as the scientific term for rickets, due chiefly to the words' similarity in sound. Vitamin D is needed in absorption of calcium and phosphorus from the intestines. Calcium and phosphorous is needed for development of healthy bones and teeth. The principal function of Vitamin D is to maintain serum calcium and phosphorus concentration within the range that supports neuromuscular function, bone calcification and other cellular processes.Vitamin D is also capable of influencing differentiation in some cancer cells, such as skin, bone, and breast cancer cells. Indeed, adequate Vitamin D status hs been linked to reduced risk of developing breast,colon and prostrate cancers. Without adequate calcium and phosphorus in the blood available for deposition in the bone, the skeleton fails to mineralize properly and bones weaken and bow under pressure. When these effects occur in a child, the disease is called rickets. Sunshine exposure: there is however, a genuine risk of skin cancer with excessive amount of unprotected sunshine exposure. Use of special sunscreens which filter the harmful rays whilst allowing for good rays to reach your skin is a good option. Ideally, sun exposure in the tropics is best done when the sun is not intense - the so-called 'morning and evening sun' as opposed to midday sun. For bone deformities such as bowlegs and some spinal deformities, braces may be used but in severe cases, surgery may be required. Dietary: Foods rich in vitamin D include fatty fish (e.g salmon and sardines), fortified milk and some fortified breakfast cereals. Although eggs, butter, liver and few brands of margarine contain some vitamin D, large servings must be eaten to obtain an appreciable amount of vitamin; thus these foods are not considered significant sources. Calcium and phosphorus consumption are also important for bone formation in childhood. Breast milk is a good source of calcium, as are most commercially available formulas. Milk and dairy products are common sources of calcium. Other sources of calcium include leafy green vegetables (for example, spinach), fortified orange juices, fortified breakfast cereals and calcium supplements. The majority of non-severe cases of both rickets and osteomalacia respond well to treatment and improvement is seen within 3-6 months. With adequate treatment and follow up, most individuals lead normal lives. The main problem encountered is reoccurrence mainly due to poor diet issues.